Sometimes you’ve got to have a big cheesy sauce topped, rich red wine sauce soaked moussaka to end your day. I love it, and make it with aubergines and potatoes. And an enriched bechamel sauce. 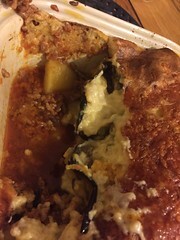 The Greek moussaka is traditionally a layered dish comprising of aubergine, a tomato sauce based meat layer, and a cheesy sauce topping (my enriched bechamel). And as I’ve said before in a previous moussaka post (yes- it’s so good I’ve written a second recipe), the turkish version is NOT layered. But equally as good. As a dinner offering, this one is quite labour intensive. 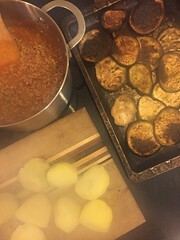 The aubergines need to be sliced and cooked, the potatoes need to be peeled and par boiled, the mince and tomato sauce needs a long slow cooking time, and the sauce needs last minute assembly. So not your jamie-oliver-15-minute-meal really. But worth it. Trust me. Using 2 tablespoons of the olive oil, oil a roasting tray. Preheat the oven to 1800C. Thinly slice the aubergine and lay the slices on the tray. Roast for about 20 minutes. Set aside. Add the remaining olive oil to a heavy based saucepan and heat gently. Brown the minced beef very slowly. Season well. Add the tinned tomatoes, the bay leaf and the wine. Cook very, very slowly over a very low heat for at least two hours, cover the saucepan partially to prevent too much moisture escaping. Set aside. Peel and place the potatoes in a pot of cold salted water. Cover and bring to the boil. The potatoes can be left over ones, and you can slice the uncooked potatoes before you boil them, if it’s easier. Bring to the boil and cook for 8 minutes until half cooked. Drain and set aside. When you are ready to assemble, melt the butter, add the flour and stir continuously over a medium heat for one minute to cook the flour out. Gradually add the milk, stirring constantly to avoid lumps. Bring to a simmer and stir until thickened. Remove from the heat, add and add half the grated cheese. Stir in the egg yolk just prior to adding the sauce to the dish. 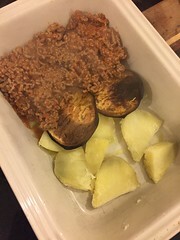 Grease the baking dish, add a layer of potatoes, then a layer of aubergines, then add the mince (remove the bay leaf first). 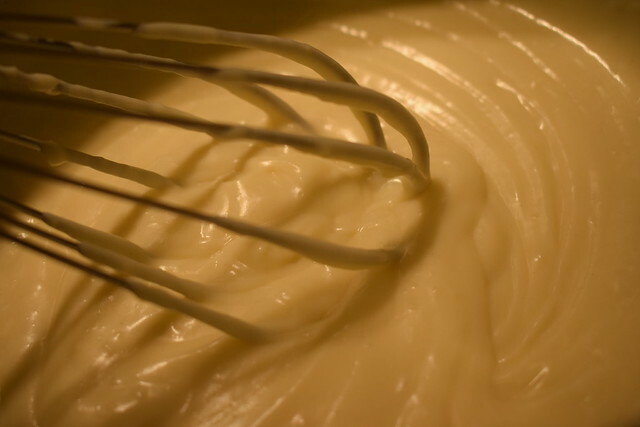 Repeat the layers on top, and add the béchamel sauce. 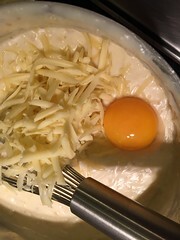 Add the rest of the grated cheese, and bake for 30 minutes. For extra carb loading serve with a baked potato and some green beans. Divine. 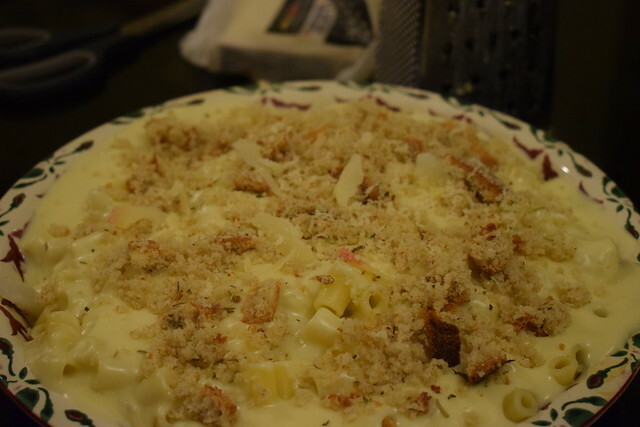 Pasta with cheese sauce casseroles have been around far longer than you imagine. In the 14th century in the Italian cookbook by Brian Liber de Coquina, one of the oldest medieval cookbooks, which featured a dish of parmesan cheese and pasta. 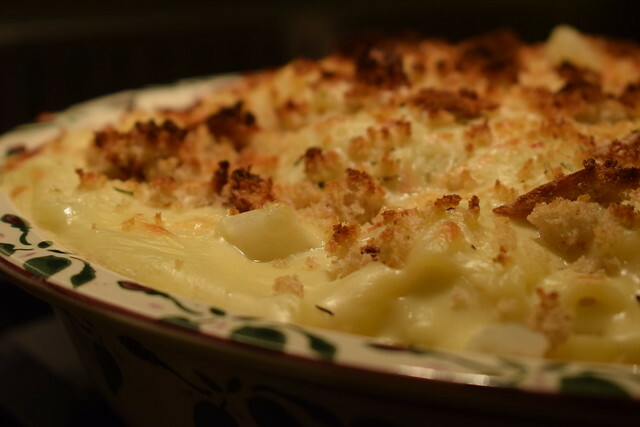 The oldest recorded recipe of a casserole with a cheese bechamel sauce, with pasta is from 1770. But the doyenne of British cookery, Mrs Beeton, valued the dish so much that she put not one, but two versions of the now classic into her housekeeping book. Nowadays this type of cooking is classed as comfort food. And there’s nothing at all wrong with that. 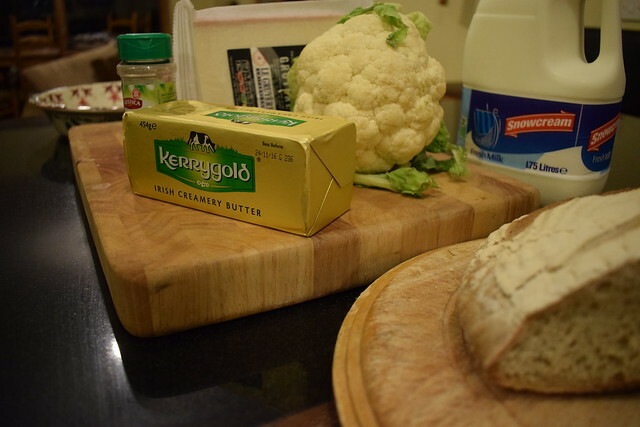 Tip the pasta and cauliflower into a large casserole dish and stir through the cheese sauce. 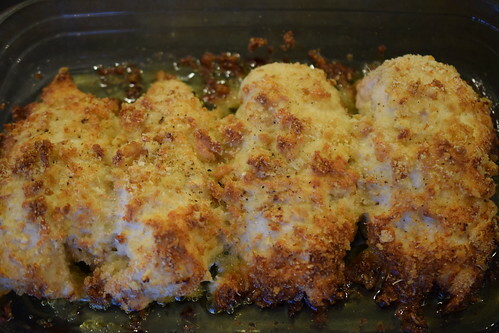 Mix together the breadcrumbs and herbs and scatter over the top. Grill for 5 mins until bubbling. Sometimes you need something quick, tasty and a little bit special on a Monday evening. This recipe fits the bill perfectly. Using ingredients that most people have in their cupboard (Hands up who DOESN’T have a bit of parmesan cheese in their fridge??). Named after the areas where it is produced, the Provinces of Parma, Reggio Emilia, Bologna (only the area to the west of the river Reno), Modena (all in Emilia-Romagna), and Mantua (in Lombardy, but only the area to the south of river Po), Italy. Most importantly, under Italian law, only cheese produced in these provinces may be labelled “Parmigiano-Reggiano”, and European law classifies the name, as well as the translation “Parmesan”, as a protected designation of origin. A little like the blaa in Waterford, and the Bramley apple in Armagh. Made from unpasteurised cow’s milk, the best cheese is from wheels laid down for 2 years or longer. Authentic Italian parmesan has ‘Parmigiano Reggiano’ stamped on the rind. The King of Cheese is only supposed to be made up of three simple ingredients, milk, salt and rennet. So maybe check the ingredients listing on the packet next time you buy. Place the egg whites in a bowl, and loosen them up with a fork. Mix the breadcrumbs, herbs and cheese together in another bowl. Pre heat the oven to 1800C. 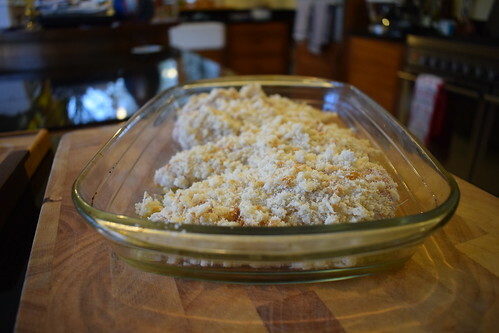 Grease the bottom of an oven proof dish that will snugly fit the 4 crumbed breasts. 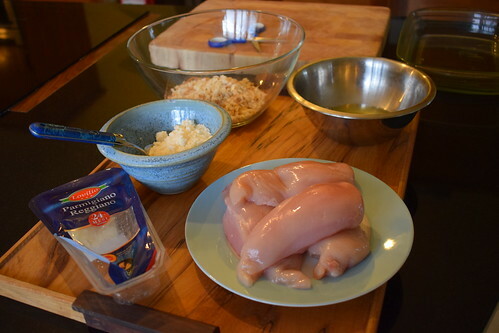 Dip each breast first in the egg white, shake it off then roll firmly in the crumb/cheese mixture. Place on the oven proof dish and then when all breasts are coated, place in the oven for 40 minutes. Serve hot with some fresh salad. I love avocados. The Hass ones are really the best, and like pears, the optimum ripeness time frame is often 30 seconds. It is the most cultivated type of avocado in California, and New Zealand. Avocados are great sources of Potassium, Magnesium, Vitamins C and E. When you open an avocado you’ll notice the lovely flesh slightly yellow in the centre, turning darker green towards the skin. This dark green flesh is high in carotenoids. Carotenoids are antioxidants that scientists have used to successfully fight cancer in a laboratory. We don’t know yet whether actually eating an avocado would reap any similar benefits. Also your body’s ability to absorb carotenoids depends in part on the presence of dietary fat, like the loads of healthy mono-unsaturated fats in avocados. So I’m willing to take the chance on this. One of the issues facing cultivation of avocados at the moment is a fungus called laurel wilt, spread by a little bug called the ambrosia bug. (Have a search under the #savetheguac). Avocado tress are related to laurel, and once infected the tree can die in as little as six weeks. The fight against this fungus has been taken to a new level with drones and sniffer dogs being used to identify trees that appear outwardly asymptomatic. So enjoy them while you can. One of our favourite starters using avocado is simply to melt some butter and add some crushed garlic to this, then split an avocado, remove the stone, pour some of the melted garlicky butter, add grated cheese and freshly ground black pepper. Voilà. What’s your favourite avocado recipe? Sushi? Guacamole? Or just eaten with some black pepper and a spoon? We get to make our own cheese. Now all I need is to grow grapes and my life is complete. Only joking… but I have wandered around cheese making for quite some time. We’ve bought rennet, moulds etc, and really I just need to get on with it. 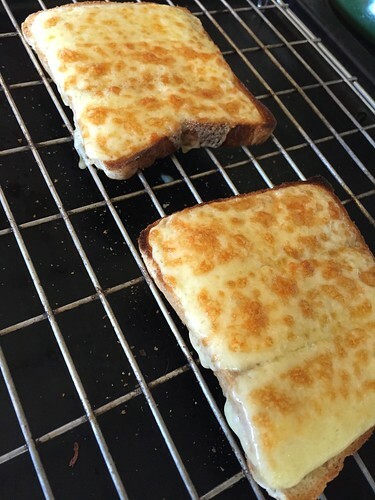 We did make a cheddar-esque cheese at home at some stage, and in actual fact, although we really didn’t have a notion of what we were doing, it tasted quite cheddar like, not a threat in the cheese production world however. Clancy met the eager cheesemakers in the dairy, and we donned VERY fetching aprons. As I microbiologist at heart, and by training, I fully appreciate how cleaniness in this case is essential. Next we removed, through a sieve, one third of the whey, and topped it up with warm water. Removing approximately one third of the whey. This is to “wash” the curd, and the warm water raises the temperature of the mixture higher, while our stirring mixed it intensively with the water. Clancy carefully monitored the temperature, and I timed the stages. Then Clancy put “our” curds into clean mould “nets”, these were left to the side while all were filled, and then topped up, as even the simple act of sitting for a short period of time meant that more liquid had drained. These moulds were then covered with a lid and weight. Clancy then instructed us on the art of turning the cheese (to reduce the appearance of elephants foot!). This looks a lot easier than it actually is. We all took turns at turning our cheese, and some kind co- students offered to further turn my cheese the two more times it required that first night. At the weekend it was un-moulded and washed in brine, and placed in the temperature controlled cabinets. Here it stays, and we turn it daily. My cheese! The second one in on the left. Cheeses that have been there for longer, have different coloured rinds. Our cheese really needs to sit for 3 months before tasting. Not enough time for me to make wine to go with it, but I may just manage some cheese biscuits. Today, being theory day, was focusing on cheese and yoghurt production. I am a massive fan of cheese, and it was great to see that so much could be made on a domestic level. We had Eddie O’Neill, from Teagasc, to instruct us in best practice when producing milk, cheese and yoghurt on both a domestic and commercial scale. The highlight for me was Eddie’s cool tie! In January 2013, the Bratli Tunnel at Tysfjord, Norway, was damaged when a lorry load of caramelised brunost caught fire. The high concentration of fat and sugar in the cheese caused it to burn fiercely at sufficiently high temperatures that the fire was still burning five days later! I am not sure about making cheese- it really involves an enormous amount of work- hats off to the artisan producers- but yoghurt, definitely, and maybe I’ll try my hand at butter. As an aside if you are visiting the Cliff House Hotel in Ardmore at any stage (HIGHLY recommended), the smoked butter is to DIE for. The morning flew, and we were all glad to partake in the obligatory tasting of the tray bakes. My personal favourite was the raspberry and coconut one. My Autumn Salad- Venison & Pinot Noir. I truly love Autumn, the slight chill in the air, the earthy smells as the leaves start to fall from the trees. This year we were incredibly lucky with our beautiful summer and felt justified in having BBQ’s and salads nearly every day. So I wanted to have an Autumn salad meal, as a transition between the two seasons. Venison is lovely at any time of the year, but I think particularly comes into it’s own in Autumn, I use our own Seika Venison, grown on the farm. I chose the pinot noir to accompany the dish as you can almost smell the autumn earthiness when you open the bottle. The soft tannins complemented the St Tola Goats cheese in the salad also. With a salad using such bold ingredients I think it’s nice to have a dressing that both draws out the other flavours and brings the whole meal together. I made a pinot reduction slowly with some of our own honey, the cherry character that finely touches the wine also goes well with the game. The venison was pan-fried first as it benefits from resting for a time, and I then used the pan to flash fry the field mushrooms, this addition to my salad further encouraged the mouth feel of autumn, before finishing off the reduction. Then it was just a matter if preparing the salad with the cheese., and the in season tomatoes. I thinly sliced the venison, and served it warm with the Cono Sur Pinot Noir. Perfection in a salad. Perfect for a Monday. Who said salads were boring?